Foreign Ministry Director General Dr. Dore Gold meets Egypt's new ambassador to Israel, as relations between the countries improve. 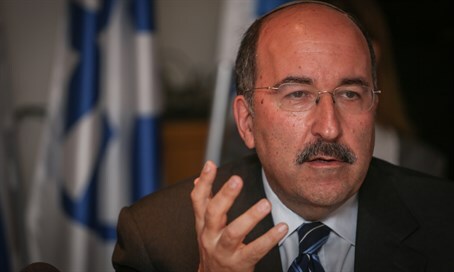 The warming of relations between Israel and Egypt continued Monday, as Foreign Ministry Director General Dr. Dore Gold met with Egypt's new ambassador to Israel, Hazem Khairat. Gold spoke with the Egyptian ambassador about his appointment and said that it marked a significant and important milestone in relations between the two countries. "Israel considers Egypt an important country in the region and the relations with it are important to Israel," he said. The two also discussed the regional challenges and the possibility of expanding bilateral cooperation in various fields. Khairat was appointed as ambassador to Israel almost a year ago, but only arrived in Israel two weeks ago to begin his term. In 2012, then Egyptian President Mohammed Morsi of the Muslim Brotherhood recalled the previous Egyptian ambassador in protest of Israel's Operation Pillar of Defense in Gaza. Morsi was later deposed and replaced by current President Abdel Fattah Al-Sisi, who has much closer relations with Israel. Egypt has been fighting a terrorist insurgency in the Sinai Peninsula in recent years, making its relations with Israel that much more important. The peace treaty signed between Egypt and Israel in 1979 imposed strict limitations on Egyptian deployment in the Sinai, but in recent years Israel has permitted the Egyptian military to boost its presence in the peninsula several times as part of its war on terrorism. Under Morsi’s regime there were calls to urgently change the peace treaty with Israel, with an adviser to the Islamist president saying that in its current form, the historic treaty maintains the national security of the “Zionist enemy” more than it helps Egypt's national security. Since Al-Sisi has taken office, however, substantial progress has been made in the relations between the two countries, and it is believed he is interested in restoring them to the level at which they were during the rule of Hosni Mubarak.